La Petite Robe Noire: (The Little Black Dress). Originally created by Sylvaine Delacourte & Delphine Jelk, introduced in 2009 as a limited edition. So what does it smell like? The original version is classified as an oriental vanilla fragrance for women. The fragrance is housed inside of a modified Bouchon Coeur flacon. The dress print adorning the bottle has been altered so that each of the past issued bottles shows a different shape of this clothing. In February 2011, Guerlain presented the second limited edition of the line - La Petite Robe Noire 2, in a new bottle and reformulated fragrance. So what does the second version smell like? It is classified as a green floral fragrance for women. In early 2012, Guerlain decided to relaunch the original (though it was slightly reformulated) and to offer the fragrance to broad market. The new La Petite Robe Noire is modified, developed by the in-house perfumer Thierry Wasser, who based his inspiration on sensual velvet giving birth to this new edition. "I am absolutely essential and utterly irresistible. I am the chic and very glamorous perfumed creation by Guerlain. My fragrance is an embroidery of the most beautiful "black" notes of perfumery: black cherry, black rose, patchouli and black tea. I was born in the laboratory of the Exclusive Collections. From that moment on, Thierry Wasser fell madly in love with me and perfected me. Barely bloomed, I was adorned in the Guerlinade, woven from the essential House ingredients. I became fresher, more couture and more sophisticated than ever." So what does the third and current version smell like? It is classified as an oriental vanilla fragrance for women. 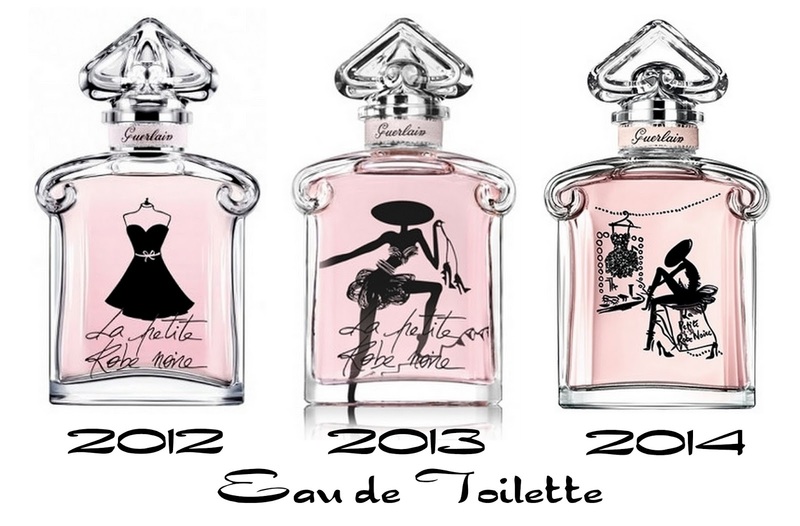 In 2012, the Eau de Toilette was released. "I am absolutely essential and utterly irresistible. I am the chic and very glamorous perfumed creation by Guerlain. 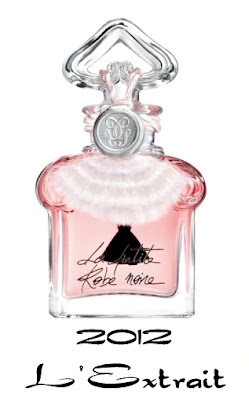 My fragrance is a fresh and swirling floral lace, embroidered with sparkling fruity notes. My glass showcase is the legendary "heart-shaped" bottle, which has been boldly reinterpreted with a modern touch. Its crystalline transparency, tinged with a delicate, powdery pink, reveals a silhouette of my sophisticated little strapless dress, ready to dance! My Pygmalion, Thierry Wasser, is smitten, as if seeing me again for the first time. One year after our encounter, he asks me to dance in order to reveal more mischievous and carefree facet of my personality. In this more swirling orchestration with its "plunging neckline," he adorns me with fresh floral lace, embroidered with sparkling and fruity notes." So what does the Eau de Toilette smell like? It is classified as a fruity floral fragrance for women. La Petite Robe Noire L'Extrait: created in 2012. The world of luxury perfumes is not so far removed from that of haute couture. 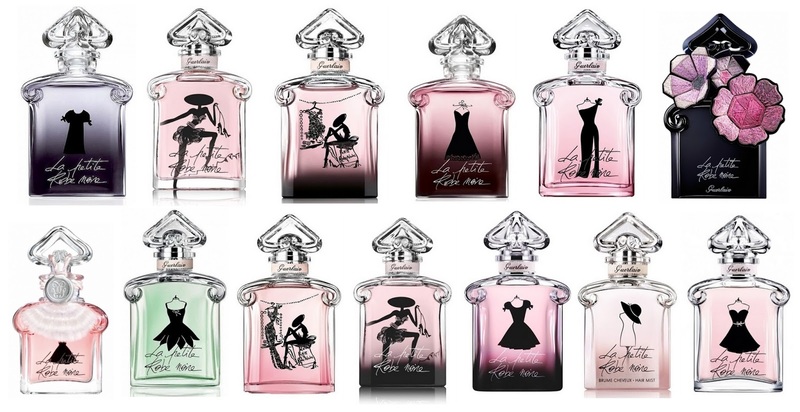 When La Petite Robe Noire was launched in 2012, a few vintage Baccarat crystal bottles were found at Guerlain’s Orphin factory. The last of a limited series of 500 bottles of this format produced in March 1912, they are of inestimable value, all of the more so as they celebrate their 100th birthday this year. "I am absolutely essential and utterly irresistible. I am the chic and very glamorous perfumed creation by Guerlain. My profound and sensual floriental scent is fashioned principally from rare and precious natural raw materials. In line with the heritage of the House, Thierry Wasser draws from the source of Haute Perfumery. He weaves a new model, the very essence of a timeless chic style, with notes as sensual as they are velvety." It appears in a decorative 7.5 ml size of the Bouchon Coeur flacon adorned with a pink cord, sealed with a silver seal disk, and the black dress image imprinted on the back. So what does it smell like? It is classified as a fruity floral gourmand fragrance for women.